There is so much to be thankful for. 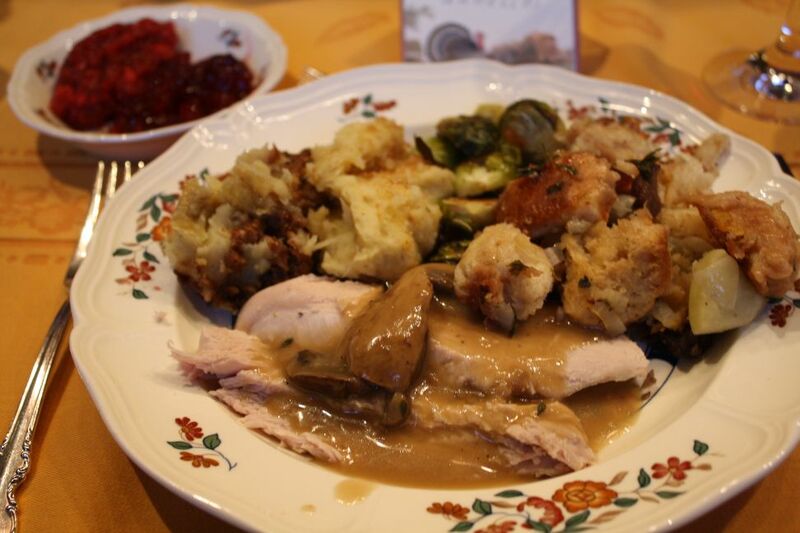 Many kids love the gifts that Christmas brings, but from a young age, I found myself enchanted with Thanksgiving. It quickly became my favorite holiday. This might have had something to do with the food. It might have had something to do with family. It might have had something to do with giving thanks. And on several occasions it had to do with friends from college joining our family table. My aunts regularly hosted the holiday at their different homes and I remember early mornings awoken by the smell of turkey roasting in the oven. Hours sitting at the table and the card games that transpired the evening before with my cousin are delicately carved in my memory too. Then there were the years we had family from Mexico join us, which was such a special occasion. Every year gave me new reasons to look forward to Thanksgiving. Being a newlywed, we had the delight of venturing up north to be with Nathan’s family on Wednesday night. My second year with them, I have enjoyed my role of sous chef to his mom’s executive chef. 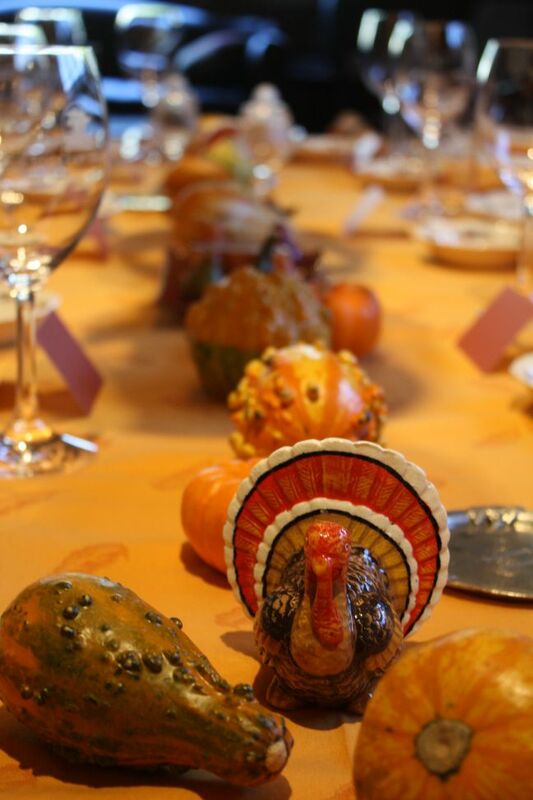 Thursday morning, we set a cheerful table with gourds running the gamut of the table’s spine and handwritten table cards with everyone’s names. We set out red wine glasses that sparkled alongside dessert wine glasses. 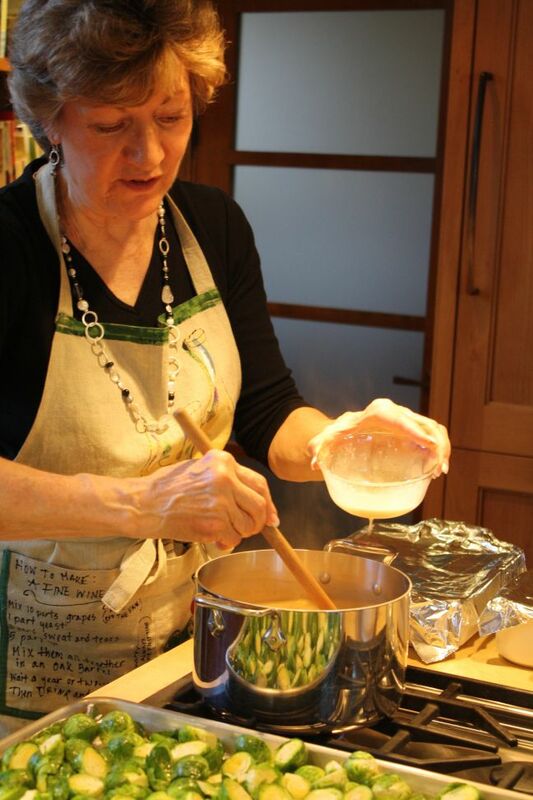 In the kitchen, we prepped Brussels sprouts and rinsed the salted turkey. 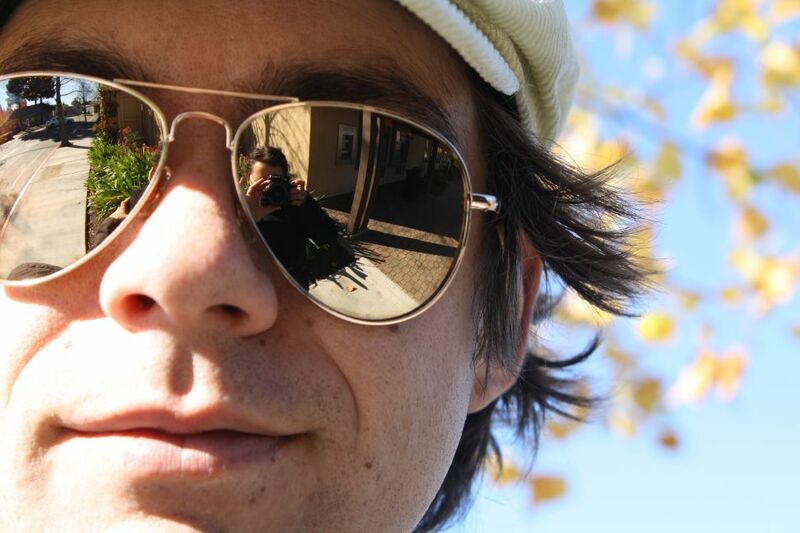 Nathan and I took a mid-morning walk around town, taking in the crisp November air that has recently fallen on the Bay Area in the form of a cold snap. Arm-in-arm we traipsed over railroad tracks and past the one open grocery store. 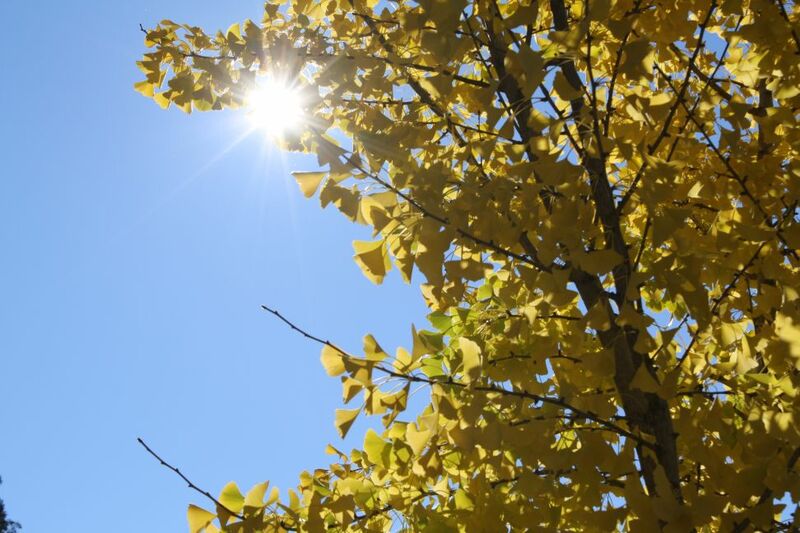 We walked past the sun high in the sky illuminating the yellow-bleached ginkgo leaves flapping like small flags in the wind. Our first Thanksgiving as an old married couple was shaping up to be something spectacular. This year, I had the pleasure of dessert duty and made two pies. I love being responsible for dessert because it’s done ahead of time and gives me time to help out with other items best suited day-of, and as described above. 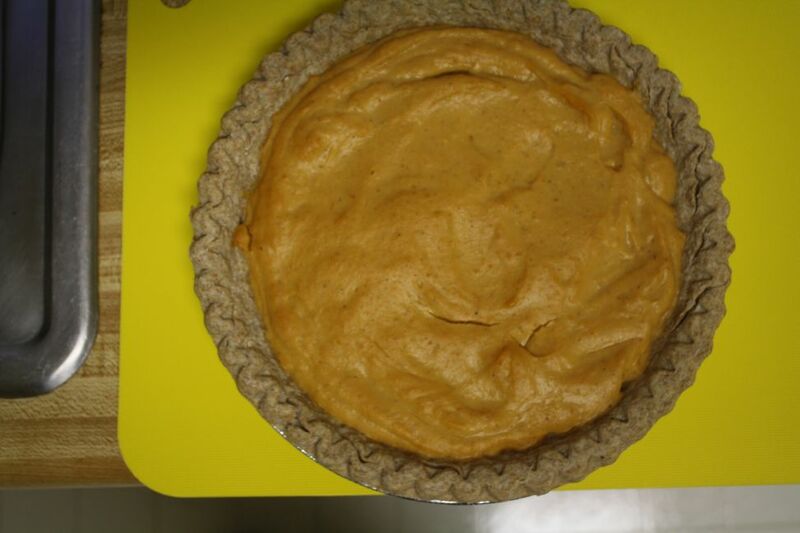 I had seen the Pumpkin Cream Pie recipe on Shutterbean’s blog last week and found it intriguing. Despite my love of pumpkin, Pumpkin Pie has never been one that holds me rapt with attention. I get that it’s a tradition and thus like opportunities to riff on that tradition. I would say this is a keeper of a recipe and of course, leave it to Martha Stewart to get it right. 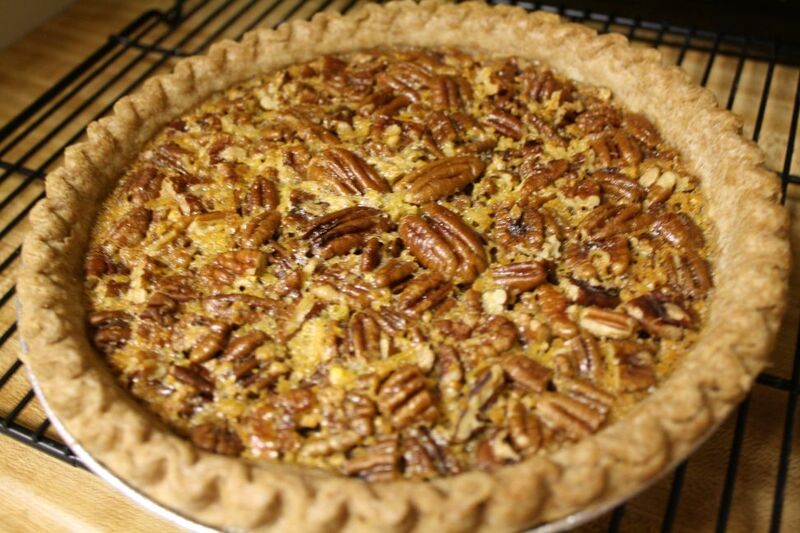 My aunt B’s pecan pie- this is what always brought me to the dessert table. Perhaps it’s because I’m from the Southwest where we name rivers “Nueces” and such, pecans run in our blood. 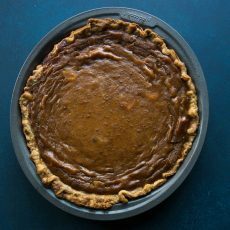 I hunted around online for an acceptable Pecan Pie recipe and happily found the one that will be my go-to from here on out at Simply Recipes. As Elise describes it there, “it’s not too sweet” and while I do love the Pecan Pie, they can sometimes taste cloyingly sweet. Beck’s sister brought a cheesecake with raisin crust which was tasty. As you can see, we had a dearth of treats. 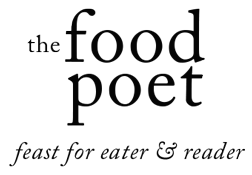 We noshed on hors d’oeuvres of shrimp and rosemary marcona almonds, an array of crackers and a parmesan artichoke heart dip with olive tapenade. We started our festivities sipping leftover champagne from the wedding- as if extending that one party into this celebration- fantastic. One of Nathan’s sister’s prepared a salad with pomegranate seeds and toasted walnuts, dressed in a pomegranate reduction sauce. Onto the bird, her husband skillfully carved it with the help of the iphone. 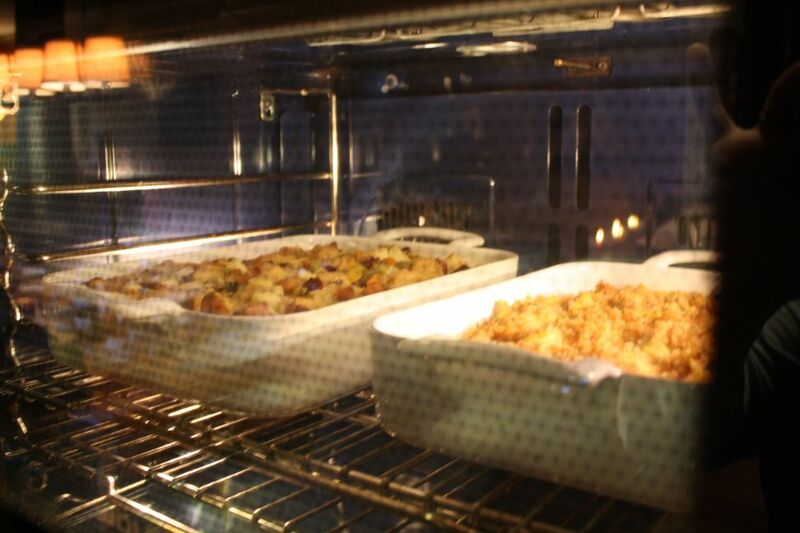 It sat alongside mashed root vegetables with garlic panko breading, a sourdough dried fruit & fig stuffing, a sweet potato banana side dish made famous by Tyler Florence for a reason and our Brussels Sprouts. With a three mushroom gravy and two kinds of cranberry- orange relish and brandied berries, we were set! Shared with new family and friends, what a feast it was.Their tradition of going around the table and sharing what each person is thankful for after the meal and before dessert is a tradition I look forward to continuing with my family. We wined and dined well into the evening, our time drunk with laughter, stories, jokes and the ribbing of siblings and family members. 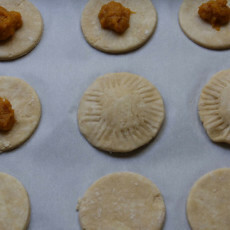 While pie crust bakes, make the pumpkin cream filling: Bring milk, vanilla, cinnamon, nutmeg, cloves, 1/4 cup sugar, and a pinch of salt to a simmer in a medium saucepan over medium heat. Meanwhile, whisk egg yolks with cornstarch and remaining 1/4 cup sugar in a medium bowl. Gradually whisk about 1/2 cup milk mixture into yolk mixture. Gradually whisk in remaining milk mixture. Return entire mixture to saucepan. Cook over medium heat, whisking constantly, until bubbling in center, about 2 minutes. Remove from heat. Immediately whisk in pumpkin. Whisk in butter. Strain filling through a fine sieve into a clean bowl. Pour into baked pie crust, smoothing the top with an offset spatula. Refrigerate until set, at least 4 hours. 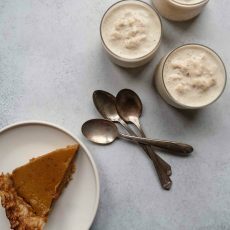 When ready to serve, top with whipped cream, and garnish with nutmeg. 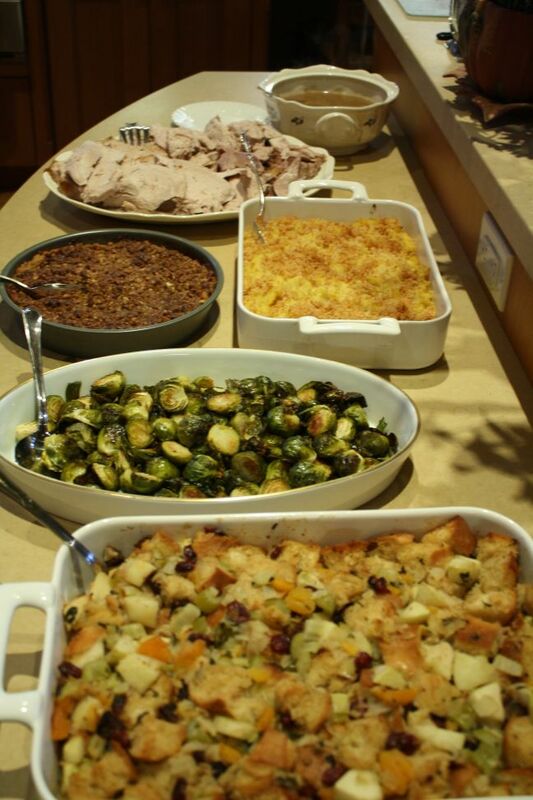 Your Thanksgiving sounds perfect…I feel like I was there from this post. I’m thankful for the opportunity to celebrate Thanksgiving through others! Also, MUST TRY THIS PECAN PIE!! Such a nice Thanksgiving, as a new-old married couple! Everything sounds wonderful; now, how did the iPhone help carve the bird? Is there a Swiss Army app? Hee hee. Hope you both have a very merry Christmas! There is an app that shows you how to carve the bird methinks. That or he just looked it up online and perched his iphone nearby for referencing! I feel like we are a new-old married couple…. that’s a great way of describing it. © Annelies Zijderveld 2007 - 2019. All rights reserved.